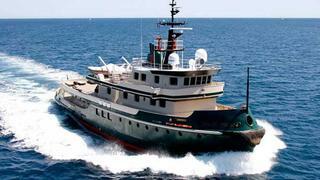 News now from Yachtzoo of a further €3.6 million price cut on the 44.2m motor yacht Ariete Primo. _Ariete Primo _was built in 1967 by Richard Dunston as a long-range tug boat and underwent a complete rebuild in 2006 to convert her into a luxury yacht of the highest quality. This superyacht now has totally new machinery and equipment, apart from her powerful engine and propulsion system. The re-build was followed in intricate detail by a fastidious and meticulous owner who wanted to retain the character of her former identity while incorporating all the new systems and comforts of a superyacht. Exotic woodwork and furnishings throughout create a warm and cosy interior and every detail has been carefully designed for total comfort and relaxation. Up to 14 guests can be accommodated in six staterooms including an owner’s suite with a private deck. The owner's suite is on the upper deck and has a king sized bed, shower and Jacuzzi. On the main deck are two doubles with queen size beds and a twin cabin while below there are a further two doubles, each with a queen size bed. All staterooms have plasma televisions, DVDs and full en suite facilities. A 2,700hp diesel engine gives her a cruising range of over 5,000 nautical miles and she will cruise at 12 knots and has a maximum speed of 15 knots. Lying in Olbia, Italy Ariete Primo is down from €13.5 million to €9.9 million.